So I just got back from a car trip… 6 hours in the car by myself and all I could think of was what I was going to make tonight and I wondered if my new Falksalt was in the mail. 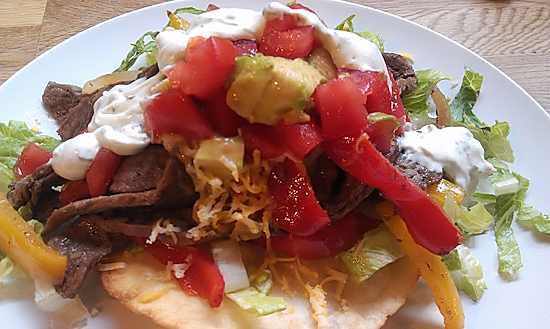 Well, half way home, I knew I wanted to try to make my own crispy tostadas out of tortillas, because if they can do that on Chopped(the TV show), so could I! I was not in the mood for ground beef, so I went fajita style for the topping and the cilantro lime cream sauce was just what I needed after this long trip! Oh and my salt was not in the mail, but don’t worry! I will be telling you all about Falksalt very soon, I can’t wait! 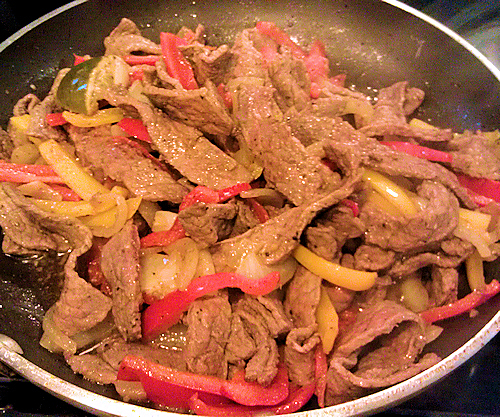 1.5 pounds of fajita sliced beef (thinly sliced steak). most grocers have this already packaged and ready to go for you or you can pick your cut and slice your own. 2 tbs 21 Seasoning Salute seasoning salt from Trader Joe’s OR any steak seasoning. 2 cups of shredded lettuce. I used romaine and sliced it. 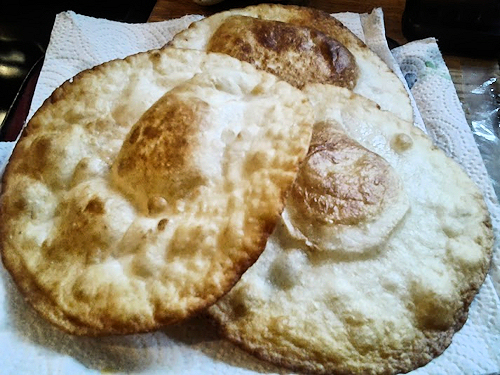 First thing to do is to get your crispy tortillas ready. Pour your oil into a skillet and put it on medium high. 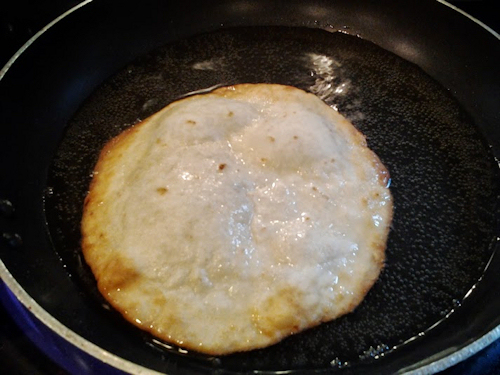 When the oil is heated you can gently lay in your tortilla. Do this one at a time. 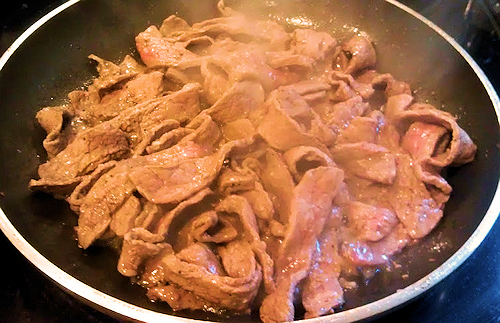 You will hear it sizzle and when it puffs, wait a few seconds then flip. When you flip it you should see a nice golden brown color. Take out and lay on a plate lined with a few paper towels and set aside. Wow, aren’t they pretty! I think I just want these with cinnamon and sugar!! 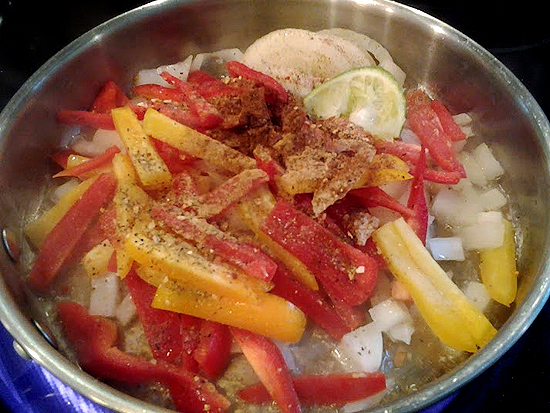 Stir and let simmer, turning the temp down to about medium – medium low, absorbing those flavors. Smelling good isn’t it? While they are simmering, go ahead and slice open your avocado. You can use 1 or two, depending on how much you like. Take the pit out, spoon out and slice in cubes. 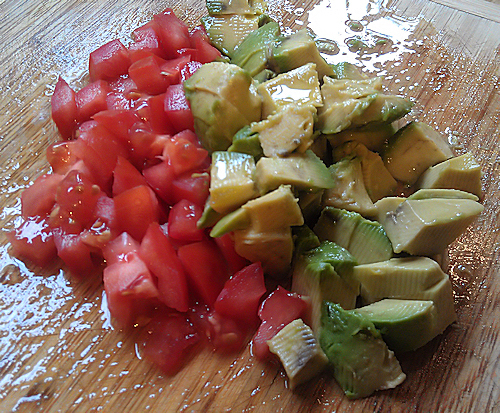 The tomato and avocado will be for your garnish. 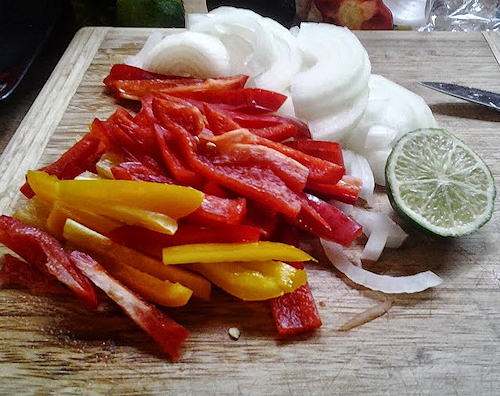 Slice your tomato into cubes as well and set aside. Time to check the pans. Stir them around with a wooden spoon making sure the steak is cooked and the veggies are getting nice and translucent but remaining bright in color. 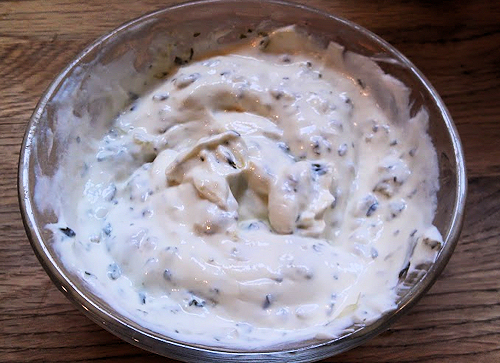 While the two pans are finishing up we can make our cream sauce. 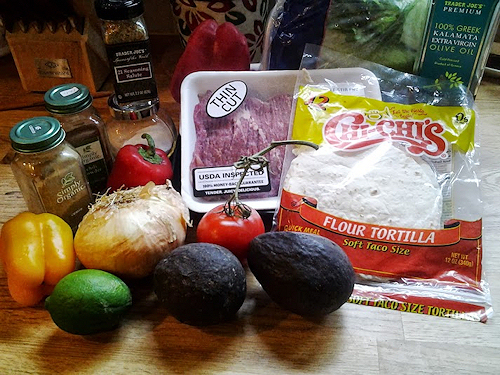 Simply add those ingredients together in one bowl and stir! 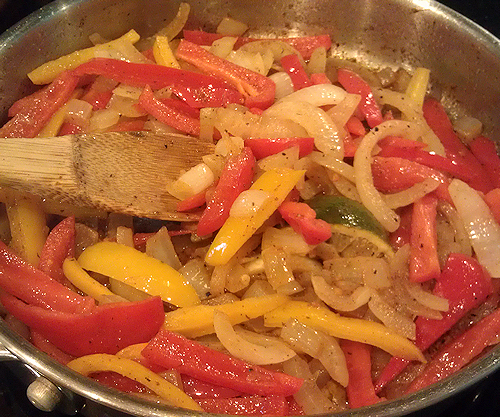 I love how easy the Gourmet Garden is to use for quick easy sauces like this but fresh is always wonderful as well! 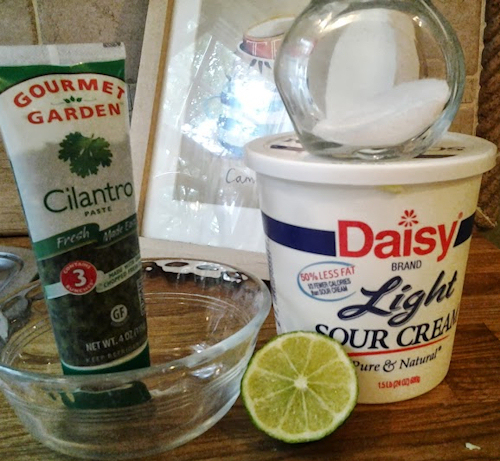 Sour cream, cilantro and lime juice with a sprinkling of salt. OK, back to the veggies and steak. This should be more than enough time and they should be ready to combine together. 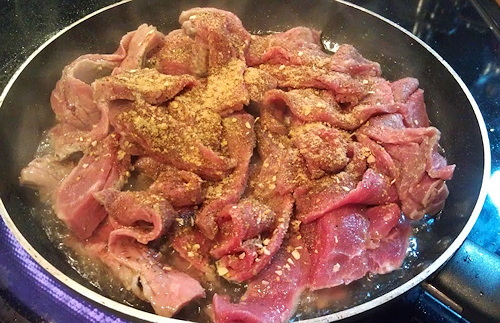 Take the veggies and put them right onto of the steak strips and stir. 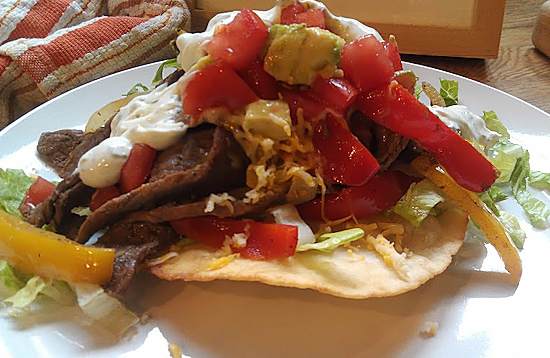 For plating, simply lay your crispy tortilla onto the plate, then apply shredded lettuce, your steak and veg, (* cheese if you would like, its optional) the tomatoes and avocado. 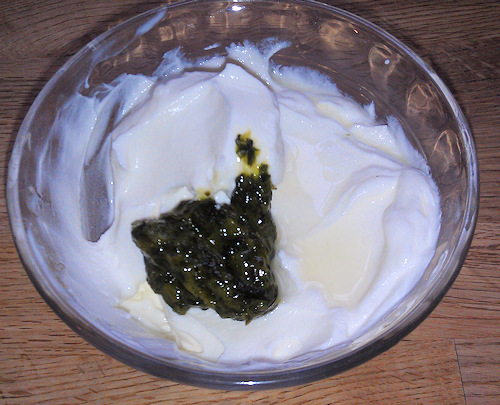 Lastly, dollop some of the cilantro cream sauce across the top and you are ready to eat. Enjoy!